My Anton Ego moment... Feltner Brothers in Fayetteville. Ever have a dish take you back in time to a particular moment, like time travel with your mouth? 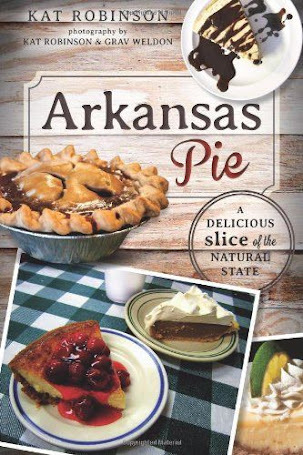 From my first bite at Feltner Brothers in Fayetteville, I was swept away to another time and place, namely Russellville in 1993. In the movie Ratatouille there is this moment where food critic Anton Ego tastes a dish and is instantly transported back to childhood (sorry, hope I haven’t ruined that for ya). The very flavor of the ratatouille he has just savored have brought him back to his youth, a memory so strong that he can hear his mother speak. I can relate to this moment. It’s only happened to me a few times, and that’s only because of the wide exposure I have to different foods. There are a few things can transport me back to a different time. Sunday, I was transported back 20 years, in a place I hadn’t expected any transformation at all. I was once again a freshman in college, having pieced together as much of my allowance as I could but still coming up short. 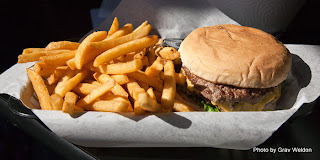 The owner of a local burger joint saw me fiddling with my change in his restaurant, asked me what I wanted and had the kids behind the counter make me up a burger and an order of fries -- an order so big I ate on it several days. You already know the story. 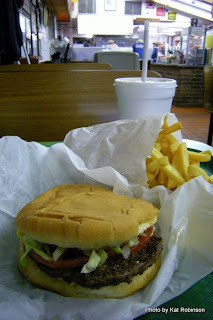 The place was Feltner’s Whatta-Burger in Russellville, AR. The man was Bob Feltner. The burger was… it was something else, a well charred and perfect piece of meat on a fluffy white bun with fresh vegetables, ketchup and Miracle Whip. It was at the time the most incredible burger I have ever eaten. You know, some folks say you can never have that perfect first experience again, whether it’s a good meal or a good experience or whatall. I grew accustomed to Whatta-Burger over the years, all through college. I once drove four hours (from Jonesboro) with my then-fiance to get one. 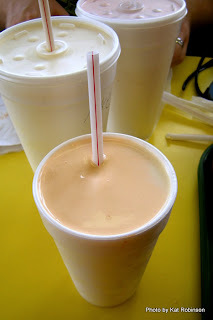 I still go by when I’m in town -- I usually hit my speed dial around Atkins and my burger, fries and shake are waiting for me when I pull up I know my order will be ready when I step up to the window. I thought I’d just become picky, though -- the nostalgia never left me, looking around at all the neat doo-dads and what-zits if I entered the store proper; the fact I could order a Sissy and get a burger with just lettuce, tomatoes and Miracle Whip; being able to order up a chocolate-cherry shake or a pineapple shake or (like my brother asked for) a peanut butter shake. But it just wasn’t as good as I remembered. I found myself going to CJ’s Butcher Boy Burgers when I really needed a burger fix, saving Whatta-Burger for family affairs and such. What I’ve recently discovered, though, is that it wasn’t my taste that changed. Somehow, the burger changed. I don’t think I’d ever have realized that had I not walked into Feltner Brothers in Fayetteville Sunday. I’d been inspired by an article in AY Magazine, an article I just couldn’t agree with. Here I’ve been these past seven months, eating more burgers than I’ve ever eaten before in my life, doing research for a year-long project on determining Arkansas’ best burgers. 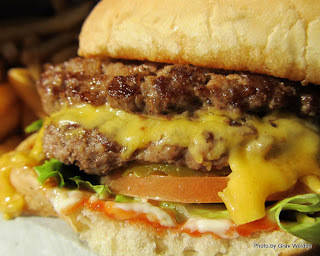 I have eaten 92 burgers this year now… most of them have been typical but there have been a few stand-outs. This particular article I just didn’t agree with. 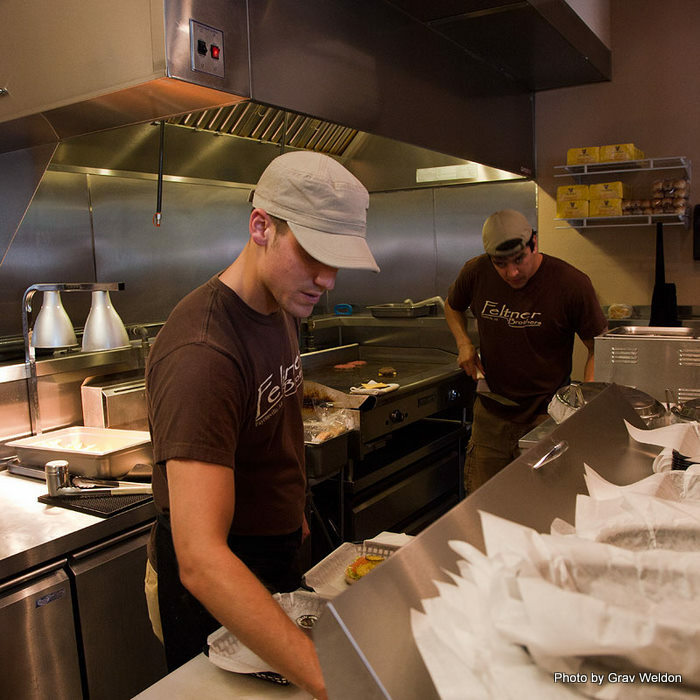 AY named its top five burgers in the state. 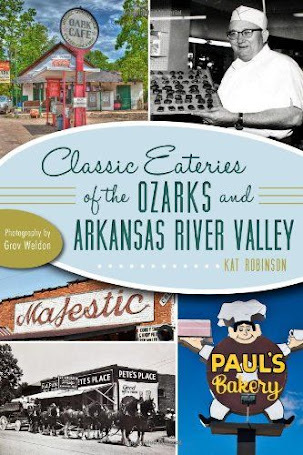 Of them, they named Buffalo Grill and Purple Cow -- both of which make my Little Rock top 20 list but neither that would ever hit my top five (which I will reveal at the end of this article). The magazine included Cheeburger Cheeburger, a national chain with decent enough food but which I would never consider to be one of the state’s best burgers (I eschew chain operations with the exception of a few very small Arkansas-only places). They had Hjem Restaurant in Fayetteville, with a Wagyu burger that included Jarlsburg cheese, spinach and beet slices, which made me queasy just reading about it (beets are my one and only severe food dislike). 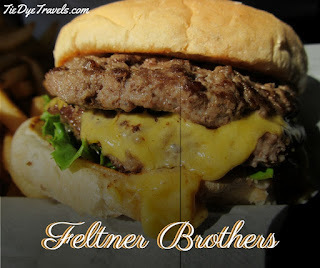 And then they had Feltner Brothers, a place I’d been meaning to check out for a long time, ever since I saw the little placard on the wall at Feltner’s Whatta-Burger that mentioned the opening of this new operation. This I was interested in. Okay. My photographer and I were on our way back from an assignment in Berryville. 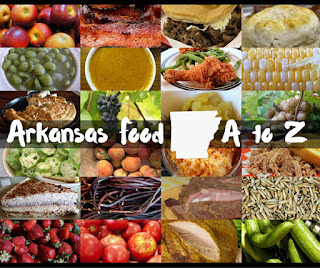 We weren’t really looking for lunch, but I have a list as long as my arm from folks in the Fayetteville on places I need to try so I knew I shouldn’t pass through without at least giving one place a stop. And the AY Magazine article was bothering me. Beets! So we used my phone’s GPS to locate Feltner Brothers. It’s on the end of a shopping center on Spring Street, a block down West Street from Dickson (if you know Fayetteville you know Dickson Street). It was a small unassuming place with a deck on the side. There were a number of spots out front earmarked just for guests at the shopping center; I’m guessing parking is a premium even here, considering the proximity to the University of Arkansas campus. We walked in and took a half-flight of stairs to the long thin dining room… picked the lone available table with good sunlight and decided to share a burger. I walked up, placed an order for a double cheeseburger with fries and a drink and asked the guy behind the register how the place was related to Feltner’s Whatta-Burger. The guy? Chase Feltner, one of Bob Feltner’s grandsons. We swapped stories about his grand-dad and he asked me what I did for a living. I told him I was a writer but was non-committal. I usually don’t reveal who I am when I go out to restaurants. So a few minutes later he comes over to the table and asks me out if I write Tie Dye Travels. I offered my mea culpa and introduced myself and my photographer. Chase told me he had read my piece a few years ago when he was out in California and that it had meant a lot to him -- and that his brother Taylor had also seen it and commented on it. That, in itself… meant a whole lot to me. So the burger comes out. He brought an extra tray and knife out with it so we could split it. 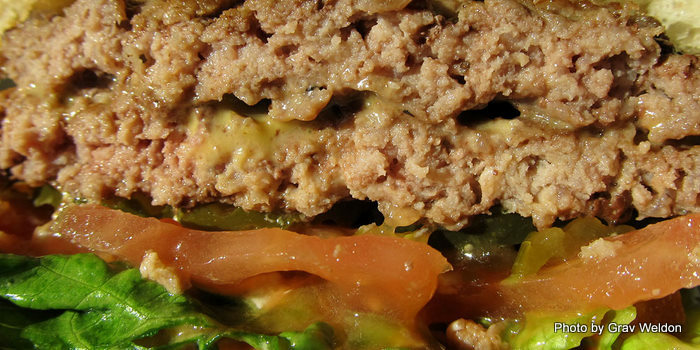 Photos were taken of the big burger and the massive mess of fries. We split the burger, and while my photographer got his shots I took a bite. And I had my Anton Ego moment. Even though I had been eating at the original Feltner’s Whatta-Burger on and off over the intervening years, something had been missing -- something elemental. Yet with one bite I had that moment, that 20 year transport back to my poor freshman days at Arkansas Tech. This was Bob Feltner’s burger. “A lot of people tell me it’s my granddad’s burger,” Chase volunteered. He and brother Travis (their younger brother Grant was off that day) had both come out to talk with us and get our impression. “It is. It’s hard to believe,” I replied. My photographer tried his and admitted it was a better burger than the Russellville store, and that it was very close to his choice for second place in his listing of best burgers in the state. “You do something else your granddad didn’t do,” I pointed out, holding up a bottle of Heinz ketchup. Bob Feltner had a lot of great things he employed in his restaurant, but he always used Hunt’s -- the one thing I just never got used to. “You gotta go with the best!” Chase told us. Now, here’s where we talk about what was really different. That would be the hot dogs. 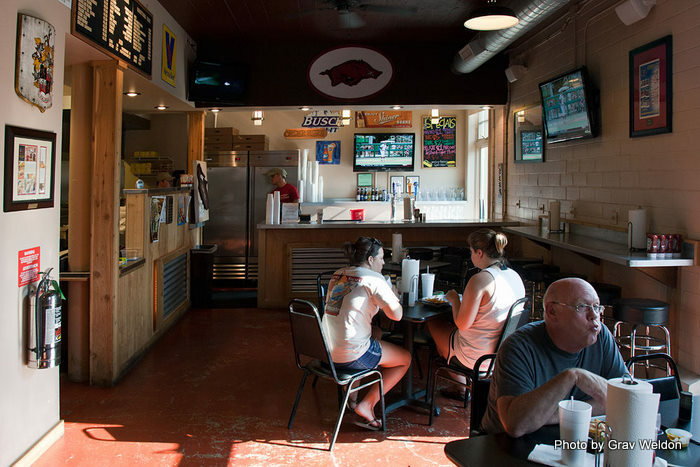 At Feltner’s Whatta-Burgers, there are hot dogs on the menu, but they’re not a big item. Dogs there are Petit Jean dogs, the red ones. Fried bologna sandwiches are also courtesy Petit Jean Meats, and there’s a great bit of Arkansas there. Sadly, that’s why I have never had a hot dog or bologna sandwich. 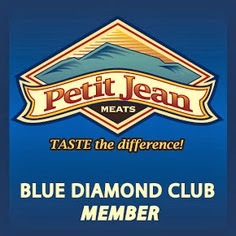 I love the products Petit Jean Meats make that are beef based; their dogs and bologna are good Arkansas pork. We noticed right off the bat that Feltner Brothers was serving Vienna Beef dogs -- because I was very hyper alert about that brand since our recent Chicago trip. Beef dogs. Yeah. On the toppings menu for the burger I had noticed relish and sport peppers. We had to know -- and my photographer would be the person who could really tell if they got a dog down right. While it was being assembled, Chase mentioned “You know Portillo’s? We have people who says our dogs are better.” Grav shared some dog notes with them, talking about Carm’s and Max’s and a few places I hadn’t heard of. The dog was delivered -- a mustard-laced poppy seed bun with a single link on it, obscured by a long dill spear, sport peppers and tomato wedges. The whole thing had been liberally dusted with celery salt. We both tried it. 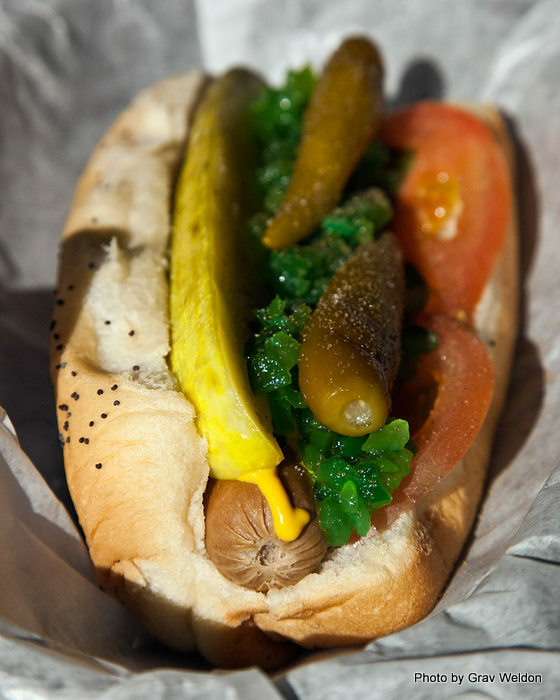 Yes, they got their Chicago dog down right. “We don’t need that many,” Chase said. We talked about the AY Magazine article, which they were proud of and surprised about at the same time. The other Fayetteville restaurant on the list, Hjem Restaurant, had its Wagyu beef patty and the beet slices, which were still ooging me out. They’re expanding, too. Feltner Brothers has been open 20 months on Spring Street; this summer they’ll open a second location on College. 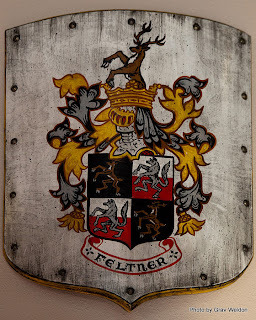 The one thing they won’t be able to replicate is this shield bearing the family arms. We had to go. A couple handshakes we were out the door. Funny thing is, we’d planned to come in, order the burger, shoot it and take it home for later. In the end we consumed the burger, a Chicago dog and most of an order of fries. But it was all worth it. 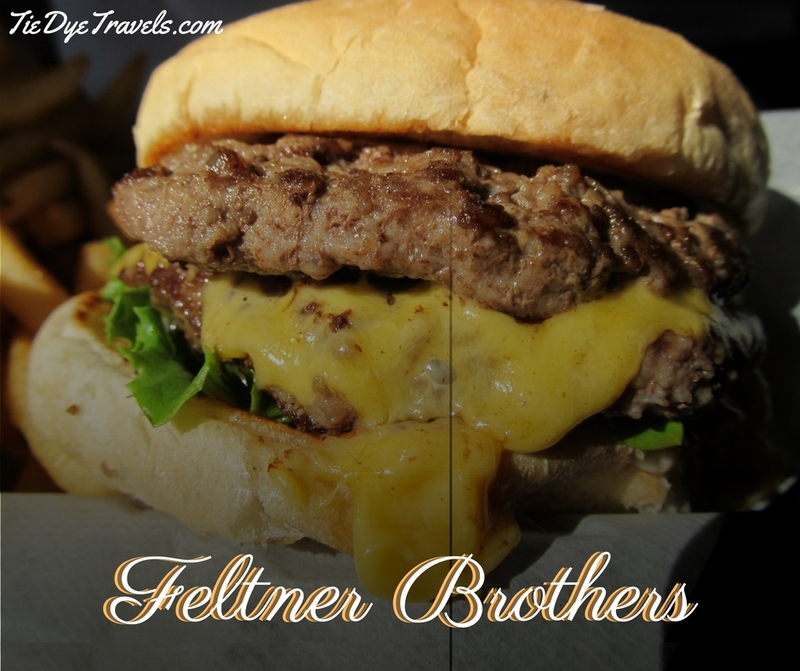 I feel I have to share Feltner Brothers with folks who shared the Feltner’s Whatta-Burger experience with me back in college. Those flat griddle-fried patties somehow have that same flavor. Feltner Brothers may be using green leaf lettuce instead of shredded iceberg and their buns may come from somewhere else but the essence is of the original famous Whatta-Burger we all knew before Old Man Feltner passed away, and it needs to be shared again, with those of us that remember and those from the next generation. 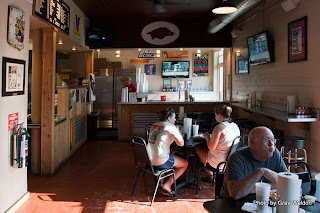 You’ll find Feltner Brothers at 509 West Spring Street 2768 North College Street in Fayetteville. They have a Facebook fan page or you can call (479) 966-4488. One more thing. I mentioned I didn't agree with AY's listing of top burgers. 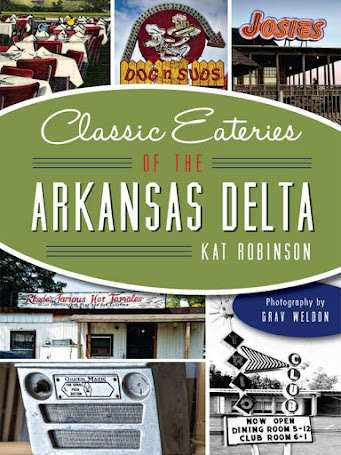 I've been doing exhaustive research on burgers all over Arkansas the past seven months. I'm not done with that research yet. But right now, my top five burgers in no particular order are from CBG, Hunka Pie, CJ's Butcher Boy Burgers, Midtown Billiards... and Feltner Brothers. Yeah, no joke. The "original" Whatta-Burger never used Hunts ketchup. Maybe you need to research some more. Well, Anonymous, I was told years ago it WAS Hunt's. I would think that being a loyal customer over 20 years would be research enough. But if it pleases you, I'll just say it isn't Heinz. It is not Heinz it is Hunts. So very proud of Chase, Travis and Grant. I am the granddaughter of Robert Feltner and Ms. Robinson, I am so glad that you met him years ago. He would be very proud of all of the hard work from the Feltner Brothers! I had to laugh at the "anonymous" ketchup fight going on. I called my mother, who is now the owner of Feltners Whatta-Burger, to try and put an end to the Hunts versus Heinz. The story is that in the very beginning it was Kraft ketchup, the plant closed down and they went to Hunts for a few weeks (didn't like it) and then switched to Heinz, which it has been for years and years. Called my dad to confirm (since he is the one who orders). Hope this puts an end to the ketchup debate! *laughs* Okay then. I recall Hunts... but then again, I did start eating there 20 years ago. After a couple of times with the unworthy ketchup I stopped even trying it. Got my fries plain (which were fine) or with chili and cheese and called it good. Thank you for confirming that. Curious to know if the Russellville location uses any food items that may contain MSG? My son absolutely loves a Whatta Cheese, but the last 3 times he has eaten one he wakes up with a horrible stomach ache and is sick all day. The first and second time I thought it was just a bug, but the third time around it seemed more than a coincidence.